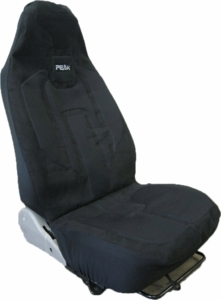 This is a 12 volt automotive seat cover that has carbon fiber thread heating elements stitched into the fabric, providing soothing warmth for the thighs and back areas. The Heated seat cover is made of a microfiber material that can be spot-cleaned. The heated seat cover slips over your seat and is additionally secured with elastic bands & plastic hooks. The Heated Seat Cover incorporates advanced F.I.R. technology (Far Infrared Rays). The infrared rays provide both gentle heat and health benefits such as stress reduction and improved blood circulation. The low voltage high performance carbon fiber heating elements eliminate electromagnetic radiation. The controller allows you to customize the heat settings at the touch of a button, including pre-heat, low, high, and standby. The heat shuts off automatically in 15 minutes. The heated seat cover is available in Black or Tan, High back or Low back (Detachable Headrest) bucket seats and for driver or passenger seat (select below). Do not use seat covers on vehicles with seat side airbags if the cover will interfere with the safety operation of the Airbag. Drivers Cover has plug on the right side (towards center of vehicle) and passenger cover has plug on left side (towards center of vehicle). 1 In-line Multi-Setting Controller that attaches to the heated seat cover. Controller includes DC Power Adapter for the cigarette lighter socket. Optional 2nd seat cover available that plugs into the same controller but will only go on when the temperature is above 39 degrees.